Figure drawn to scale? Guesstimate that ish. Here’s an important thing to remember: all figures on the SAT are drawn to scale unless indicated otherwise. In other words, if it doesn’t say “Note: figure not drawn to scale,” underneath it, it is drawn to scale. 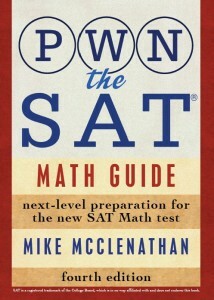 Most figures on the SAT are drawn to scale, which means it’s a good idea to guesstimate whenever possible. 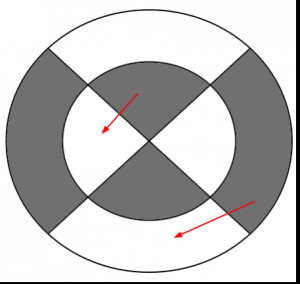 The figure above depicts two intersecting diameters of two concentric circles of radius 6 and 10. If the diameters are perpendicular, what is the area of the shaded regions? STOP DOING MATH! You need almost none of it to solve this problem. How can you guesstimate this? Well, what’s the area of the large circle? 100π. What’s half of that? 50π. Good, the answer is (B). Done. Why? Glad you asked. What happens if I rearrange the pieces of the puzzle? OH HELL YES. Look at that. Doesn’t that excite you? I love guesstimating so friggin’ much. Note that guesstimating doesn’t just apply to shaded regions. You can use it to solve all kinds of geometry questions. As long as a figure is drawn to scale, you should ponder the implications of guesstimate for a few seconds before you start doing any math. This takes practice, but I promise you it’s worth it when you become proficient. The questions below can be solved with math, but your mission is to solve them with guesstimate. Make me proud. Don’t stop! Don’t ever stop! Can you solve #4 on Diagnostic Test 2? With the info given, I can immediately reason that the area of the shaded triangle is less than half the area of the circle. And using a bit of algebra and geometry, we can call the area of the circle pi*r^2 and the area of the triangles 4*r^2. And I could set up the percentage question as: 4*r^2 = x/100 *pi*r^2, but without any numbers, I have no idea how to get to 1/pi as the answer. You mean #4 from this drill? Sure! Say (just for kicks) that the radius of the circle is 2. That’s the plug-in bit. 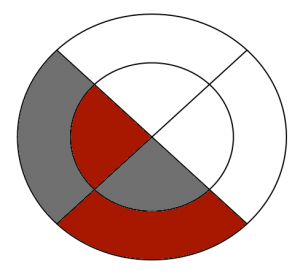 The circle’s area, then, is 2π. Now take a close look at the shaded triangles. They’re both right triangles, and since their legs each emanate from N, each leg is a radius. So you’re looking at 2 45˚-45˚-90˚ triangles. If you put the top one on bottom and the bottom one on top, you’d be looking at a square with sides of length 2. That’s the guesstimate bit. A square with sides of length 2 has an area of 4. 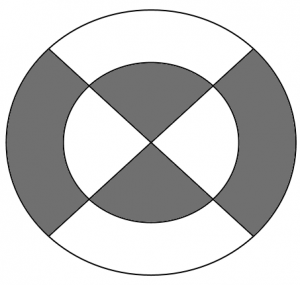 The circle’s area is 4π. That’s why the fraction of the area that’s shaded is 4/4π, or 1/π. Yup! I wasn’t thinking about plugging-in to solve, just doing algebra. Plugging-in makes sense! Right. We’re adding two triangles—they make a square with sides of length 2. They’re shaded. The square had an area of 4.
if the radius is 2 how is the square side also 2? it should then be 2 root of 2 right? No. 2 root 2 is the diagonal of the square. Take the top triangle and slide it down so it’s underneath the bottom one. You make a square with sides of length 2. Hi can you please explain both of these problems. I kind of have an idea of how to solve 20 but I just want to make sure my work is correct. As for 19, these number lines/points on a graph ALWAYS give me a hard time. The algebra for 19 is tricky. Luckily, since it’s drawn to scale, all you really need to do is recognize that CD is smaller than AB. Since you know AB is 4, you can eliminate all the answer choices that are greater than or equal to 4. That only leaves you with one choice! For 20, use your pencil (or your eyes) to compare the part of SP that’s outside the circle to the circle’s radius, which you know is 3. It looks like less than half, right? But bigger than a third. Since you know the diameter is 6, SP is going to be 6 + that extra length, which is between a third and a half of 3. That only leaves choice (D). Of course, there are straight-up math solutions to these questions as well, but I designed them not to make you do tough algebra, but rather to see a clever way to avoid it on some geometry problems when the figures are drawn to scale. How do you know its 100pi, the are of large circle? OHH. never mind i get it, sorry.